The infinite bond between your loved one and you is written on your heart, yearning to be expressed. This exquisite infinity heart pendant is designed to bring you comfort and give you guidance and protection in times you find yourself on a difficult path in life. There is nothing more comforting than the knowledge that your angels are by your side, and that you will always have your precious memories of them, commemorated with the deeply touching words, “Always on my mind, forever in my heart,” engraved on the pendant. 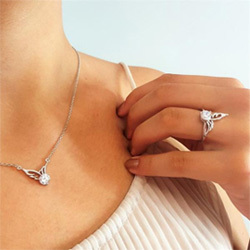 The gorgeous pendant is complimented by a delicate angel wing, reminding you that your loved ones are right by your side. Making a truly thoughtful and beautiful gift for yourself or someone special, this keepsake will be a treasured choice for years to come. I absolutely love it. I feel like my husband is closer to me. I bought for my niece which I think she will love. Her daughter my great-niece took her own life last year. It was devastating to us all. She was a loving person with mental problems. I've needed a necklace that would remind me of my Dad and hold up with being worn often. So far, this is meeting the mark. I really like it. Well pleased with my order, had I know they were that nice I would have ordered more, but will re-order again. I was very pleased with the necklace. It far exceed my expectations, it's light weight and looks great. Love the inscription, tha'ts the real reason for my purchase.. I love it and I wear it just about everyday. Because of the loss of my husband and sister I love to wear it. It has special meaning to me. I was very pleased with this one! I cannot send you photos, as both my purchases were gifts to two women who lost 2 different loved ones, in the same family. I can tell you they were both well received and thought of as beautiful. They were the "perfect" gift for both. This piece was exactly what my Mother wanted, a gift that was simple but to the point and an item she can choose to wear close to her heart like the man she loved and lost. Definitely a beautiful and touching piece of jewelry. Would buy again and would recommend. I received my order in just a few days and was very pleased. The quality was excellent for the price and it was very lovely. I ordered this necklace in rememberance of my father. Thank you for making these beautiful pieces of jewelry. This is wonderful treasure of the love I have for my husband who recently passed God bless your company for what they do. My Aunt loved the necklace. Something special to share between us. I just lost my brother and hubsndad. It makes me feel their presence. Having recently lost my husband, the saying is exactly how I feel. I had just received my necklace and promptly put it on. Within a few hours of wearing it, I received many compliments about it! I am excited to wear it as it represents my heart for my Mother and Mother in Law who have passed. My favorite saying. Beautiful thank you.